There are things you just have to see with your own eyes to get the real sense of it. The Musical Arts Center (MAC) in Bloomington is a case in point. 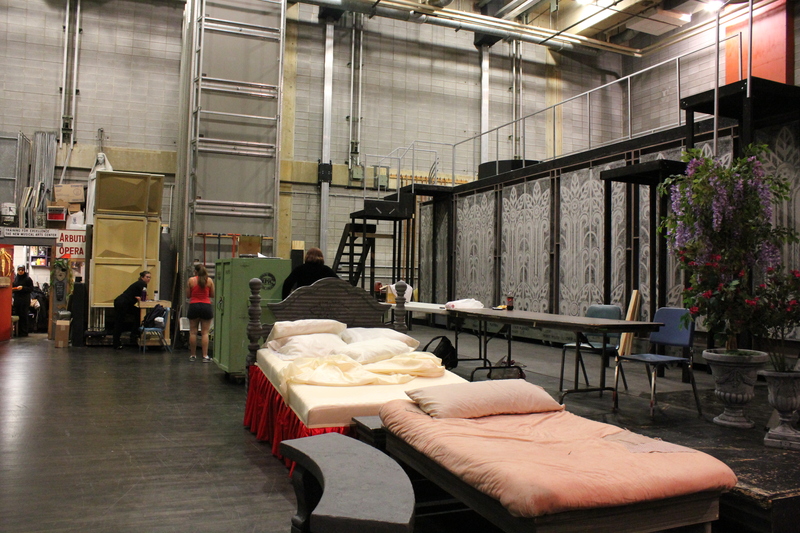 The tour of the MAC opens a door into a behind-the-scenes world that gives you a glimpse into some “mysterious” aspects involved in the production of an opera. 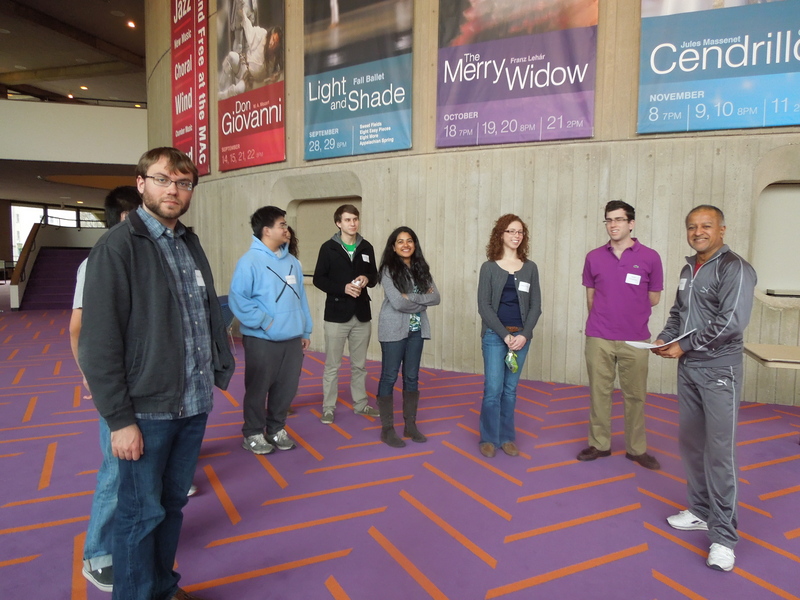 A tour with Marketing Outreach and House Manager of IU Opera Theater, Tridib Pal, promises more exciting things as he is a musician, loves arts and has great understanding of the history and design of IU Opera Theater. Tridib Pal (far right) and his tour with Wells Scholars. 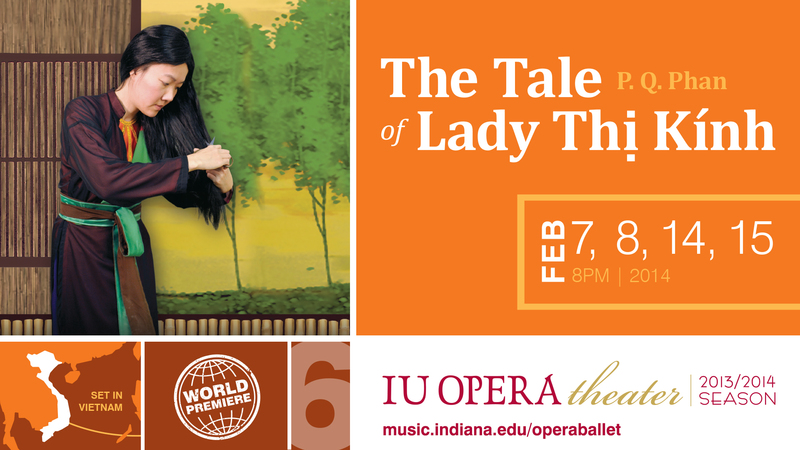 IU Opera Theater is housed under the roof of the MAC. The tour of the MAC starts at the public area, the hall, where people come when they go to a concert or an opera. Steeping foot inside, one already feels the sense of calm and relaxation as nobody is carrying the go-getting attitude here for anything. This is the space for you to calm yourself down and get ready to enjoy the show. The environment is designed to bring you closer to this state of mind as well. The open space in the big hall with no objects in the way to obstruct the view is a great treat for the eyes and also for the mind. 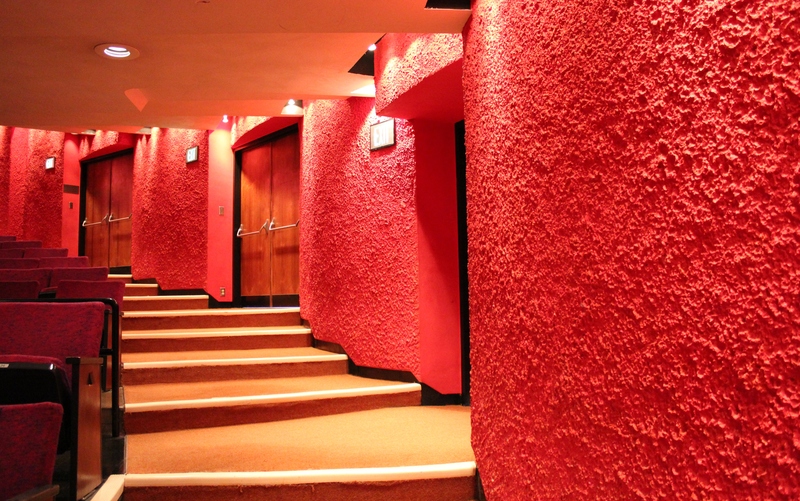 The one-of-a-kind carpet pattern sets you up for the artistic atmosphere of the theater paving the way for the coming performance on stage. As your stress is down and your calm is up, you are ready to enter the house (e.g. audience space.) 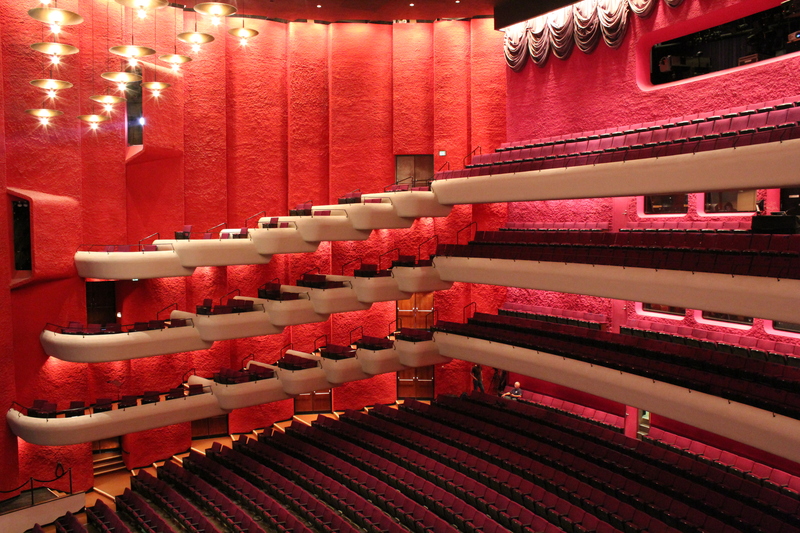 With the seating capacity of 1,460 the MAC is big enough to mesmerize opera lovers with the wonders it can offer on stage. As for the first time opera goers, they will be amazed. Yet the theater is not too big to intimidate them. Textured walls in the House. 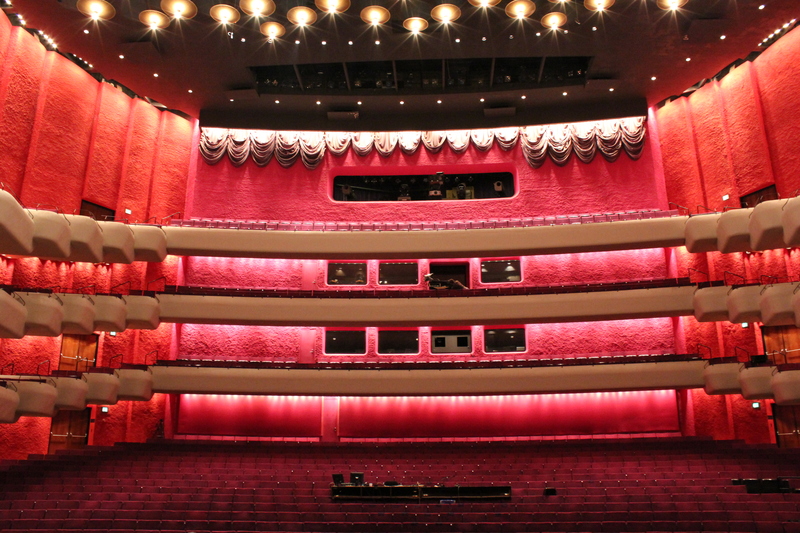 The design inside the theater is typical of European opera houses with no internal isles. The colors of the MAC are original as chosen by the architect who built it more than 40 years ago. 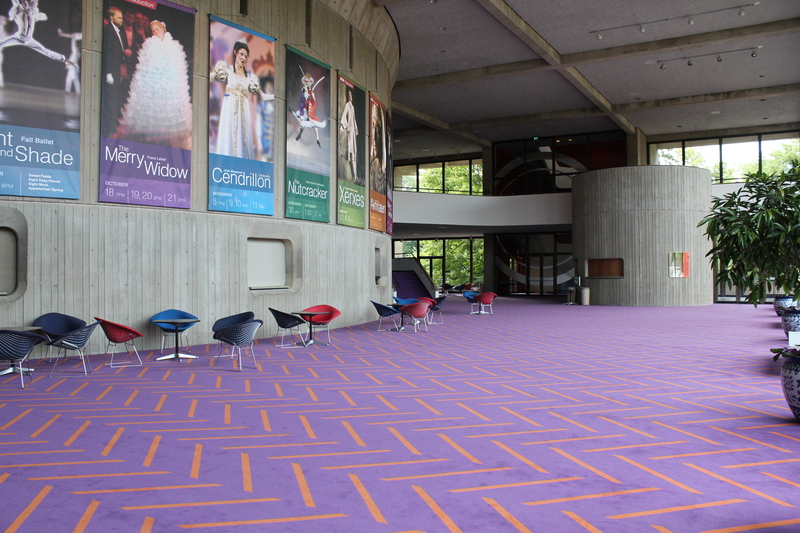 The nontraditional pallet of orange, pink and purple creates a very modern and lively environment as you walk into the performance hall. Step on the performance stage facing the audience, and you are at the center of the universe: fifteen hundred people on red cloth seats in front of you, bright light over your head and all over you, the performance stage being surrounded by a myriad of lighting, audio and staging equipment managed by technicians who can easily fly you across the stage or create snow or build a lavish banquet scene. This central spot on stage is the action center of a kaleidoscope of light, sound, spectacle, spectators, singers, actors, technicians – all commingling to deliver a sense of multi dimensions that you can really feel. Still with your back to the audience, look around to feel the sense of space. The main stage is 90 feet wide by 60 feet deep. Straight ahead on the rear, on the left and on right are three different platforms. They are all wagons, they are all on wheels, and they are all on tracks. If need to, Mr. Pal continued, “we can hook the wagons together so the entire wagon can move out, or we can disconnect and move a part of them.” The whole wagon is the same size of the performance stage. Could you imagine how the stage moves and turns around during a performance now? 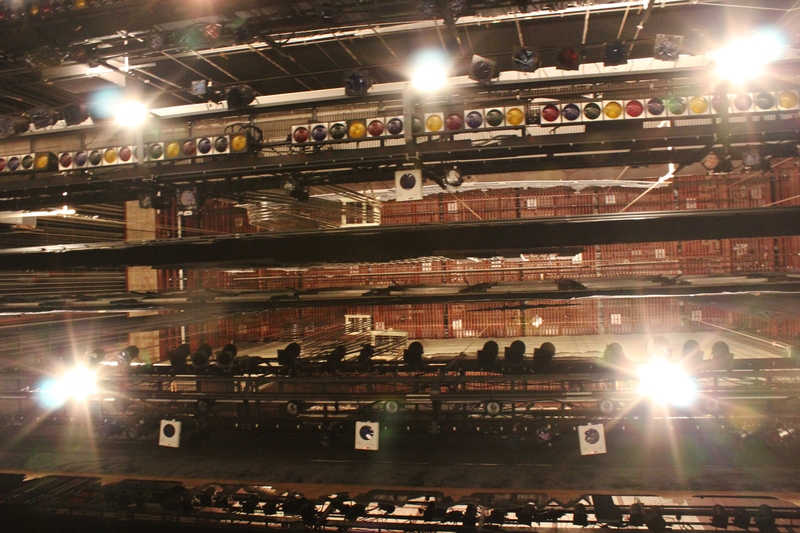 Then, try to catch this: Depending on the schedule, the platforms can become space to prepare the setting for more than one opera at the same time. 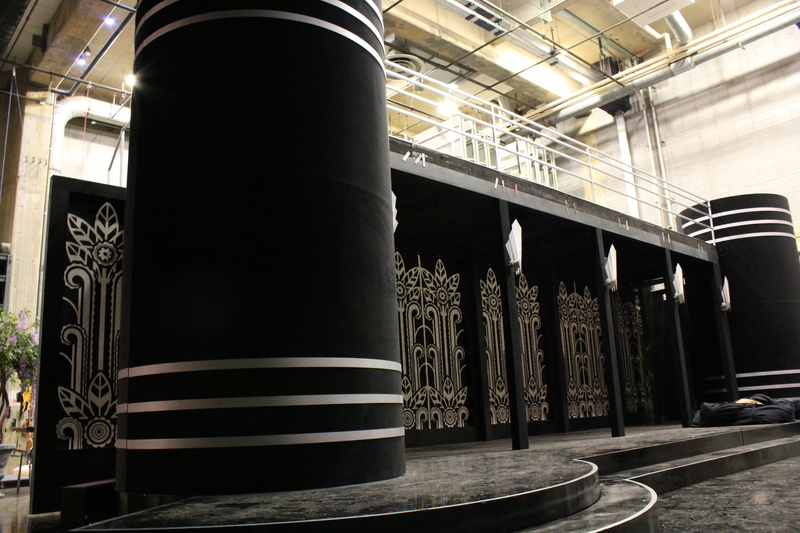 Each platform has soundproof panels that can come down and close off, as Mr. Pal narrated, so that they can actually have a performance going on on the main stage while working on some other rehearsal behind it. How genius! Now you understand why people often say that the part of the stage that you see during a performance is only about one third of the real size of the whole stage. 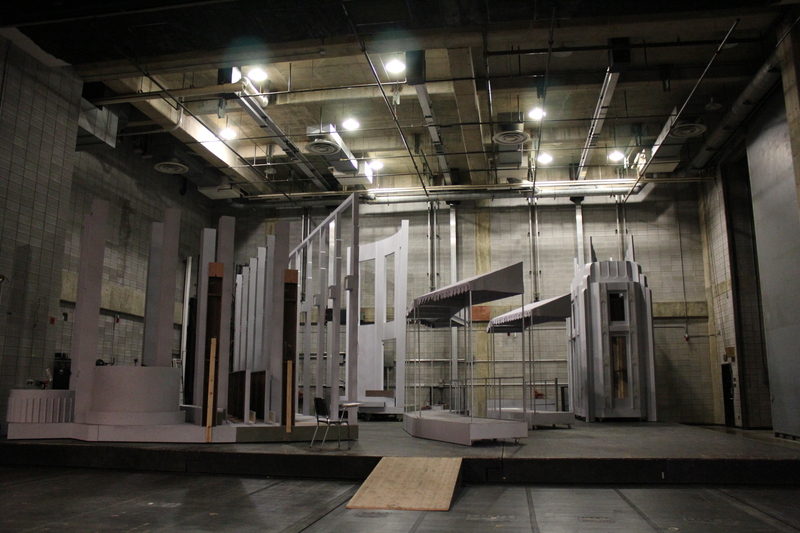 The backstage area does occupy more than half the building and provides a state-of-the art theater space for technical work. Many Jacobs School of Music students don’t realize that this facility is very unusual to have at a university. Mr. Pal said that he often reminds the students not to get too spoiled and take for granted the magnitude of the program and facility here. Their first job singing with a professional orchestra may not come with access to this kind of stage. Half the platform on the right. Another half of platform on the right. At the end of the tour, one cannot help feeling a sense of luxury, luxury of materials – real wood, real paint, real cloths, real curtains; luxury of space – big and small, dark and bright, round and rectangular, thin and thick. But wait, all is for free. Just register in advance, then come join the tour for an incredible experience! ***** The Vietnamese version of this article has been printed and published by the Viễn Đông Daily News. Read my online Vietnamese version.